Peace and prosperity are nearly inseparable. When one is absent, the other is at risk. Violence and war rob people of the chance to better their lives through hard work. And when a society struggles with poverty and unemployment, it sets the stage for unrest. At the same time, peace and prosperity can form a virtuous circle. A peaceful community is one in which people have choices about their future. Prosperity helps ensure that people have a stake in society, eliminating many of the underlying causes of conflict. Today, on the International Day of Peace, TechnoServe is spreading a simple message: Peace pays. We are partnering with Peace One Day, a U.K.-based nonprofit that helped make each Sept. 21 a day of global ceasefire and non-violence, recognized by the United Nations. TechnoServe has joined the call for a Global Truce on Peace Day 2012, which Peace One Day hopes will be the largest reduction in global violence in recorded history. TechnoServe is an organization that applies business solutions to the problem of poverty in the developing world. Nowhere does our mission explicitly mention peace. Yet the goal of a peaceful world is inherent in everything we do. Our work takes place in countries that have suffered from violence and war. The threat still looms for many, as we saw in Côte D’Ivoire earlier this year, or Kenya in 2007. Others, such as Nicaragua and Mozambique, bear the scars of prolonged civil wars. El Salvador, Honduras and Guatemala have among the highest homicide rates in the world. TechnoServe’s work helps remedy many of the root causes of violence – hunger, inequality, a lack of opportunity – by encouraging economic sustainability. We help smallholder farmers to improve their production and access markets. We foster promising entrepreneurs in order to create a network of small and growing businesses. We promote conditions that lead to job creation and economic growth. Since the early 1990s, TechnoServe has worked with farmer groups composed of former guerillas in Nicaragua’s civil war. The members of these groups have learned to diversify their crops, improve their business skills and connect to better markets. Onetime soldiers such as Victor Rodriguez, a farmer in the town of El Tuma-La Dalia (pictured above) where he is vice president of the Jorge Salazar Cooperative, have been able to provide for their families after starting with nothing. More than 20 years removed from the war, Victor is sending a son to college, and two more plan to follow in his footsteps. (Entrepreneur Sara Adico speaks at an awards ceremony for a TechnoServe business plan competition in Abidjan, Côte d’Ivoire. Image credit: TechnoServe). In Côte D’Ivoire, a TechnoServe business plan competition, supported by the World Bank’s State and Peace-Building Fund, is helping to address some of the underlying north-south tensions that have led to conflicts in the past. After completing one cycle of the competition in Abidjan, we are rolling out the program to the central region of Bouaké and hope to expand more widely in central and northern Côte D’Ivoire. This work will create new opportunities in rural areas, helping to lessen the economic disparities and promote reconciliation between north and south. 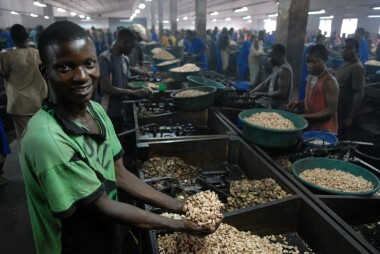 (Lucas Domingo, a worker at the Condor cashew factory near the city of Nampula in northern Mozambique. Photo credit: TechnoServe). Mozambique’s 15-year civil war devastated the country’s economy. TechnoServe has worked to rebuild the cashew industry by helping entrepreneurs establish processing plants and training farmers to produce more and better nuts. Today, rural communities in northern Mozambique are prospering thanks to jobs and market opportunities created by the cashew industry. Thousands of employees and tens of thousands of small-scale producers are benefiting from higher incomes. This type of development fosters peaceful conditions, and peace makes success easier to achieve. That’s why TechnoServe is celebrating Peace Day across the world. Visit Peace One Day’s website to join us in the call for a Global Truce. In a world without violence, everyone can have a chance to escape poverty.